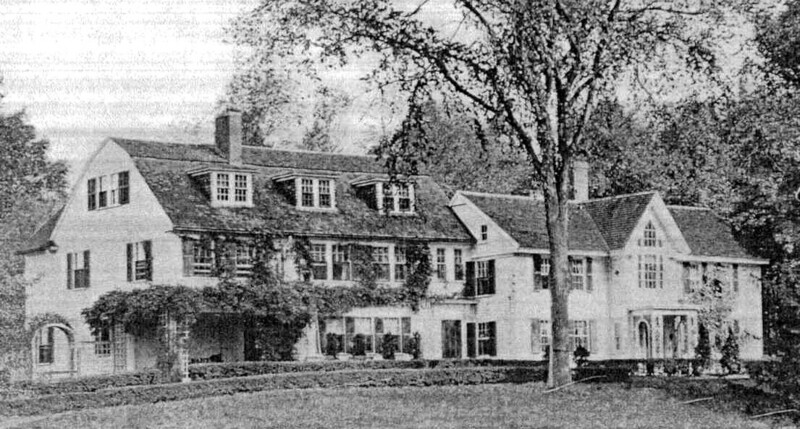 In 1927, Mary Byers Smith purchased the house attached on the north side of the house at 59 Central and barn from the Nathaniel E. Bartlett estate, and moved them north about 50 feet to its original location at 57 Central St. The west wing, built as a servant’s quarter with ten rooms and five bedrooms, was detached about ten years later and moved west to its current location at 63 Central St. At that time Anne W. Bartlett was the owner. Addison LeBoutillier, Andover artist and architect, then updated the Bartlett home as a single family residence. 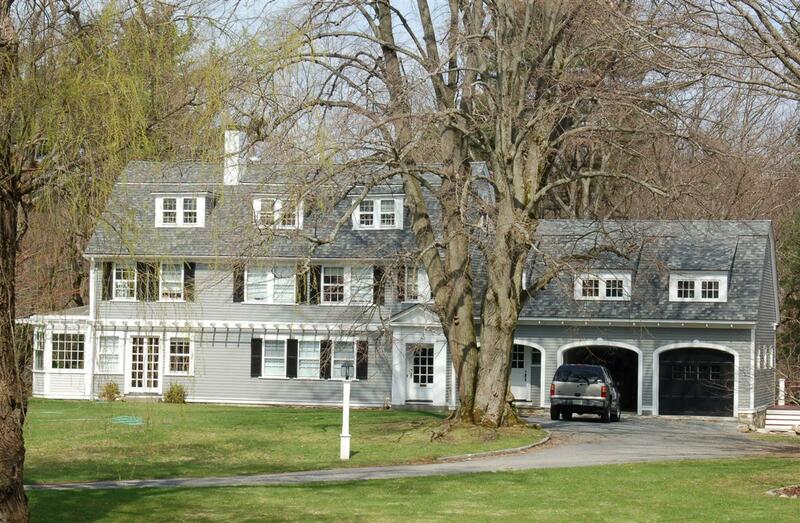 LeBoutillier was one of four architects chosen by William Madison Wood to design homes in Shawsheen Village between 1918-1924, and also designed a number of other residential and municipal buildings in Andover. Anne and Mary Bartlett painted landscape murals on the first and second floor hallway walls that remain intact. "I Take a Walk with My Memory" - By F. Tyler Carlton, May 1961 (Excerpts from his memories as a child and the owner of 57-59 Central St.) F. Tyler Carlton, b. 1904 d. August 14, 1968, age 64, grew up at 67 Central Street, and was a native of Andover. Mr. Bartlett added on at the back a huge three-storied wing. It was about eight feet narrower than the rear of the old house. From the south-center of the back wall of the living room a door led into the back hall and an outside one on the left opened onto a wide 'brick walkway that extended along the newly added wing between drive, barberry hedge, and lawn on one side, and flower bed and house on the other. Across the hall was the dining room and beyond that an open brick-floored porch. At the right the hall paralleled the stairs to a coat closet where a door to the left went into the pantry and the kitchen beyond. Back of the kitchen there was at the left a cook's pantry, in the center a short flight of stairs to the back door, and on the right a living room for the maids. The stairs to the second floor led up what was the rear outside wall of the original house. At the top and to the left was the master bedroom; around to the right at the opposite end, over the coat closet a bath; and at the right over the north end of the living room a small guest chamber. At the end of this upper hall, and up two steps, was the dormitory like corridor down the center of the wing. First on the right was a bath, opposite it was John's room, then Sally's, and on the left Nat's. May had the north corner and Eleanor the south room over the porch. The stairs went up another flight via a cross landing to another long corridor with bath and two bedrooms for the maids, and a large playroom at the far end. Large closets under the eaves allowed storage of toys, costumes, or dresses in process of making. The summerhouse that was across the drive from the porch (59) was later moved west to the top of the knoll where No. 63 now is. Just a little nearer the street was the carriage shed, the under part of which served as a chicken coop, the yard taking in most of the brook valley over to B. F. Smith's. Number 63 is the big wing that Mr. Bartlett had added to No. 59 in 1908 and which Mrs. Bartlett cut off and moved back here in 1930. May and Mrs. Bartlett were quite artistic and I believe that the mural decoration in the hall may have been done by them. May also beautified that brook valley, after the carriage shed was torn down, making it into a sunken garden." Historical significance: see historical narratives for 57 Central Street & 59 Central Street for more information.